Ever Wondered what Two Dozen Oysters Look Like? Happy hours are fantastic! You save a dollar or two on a drink, perhaps order an appetizer, and hang out with your friends earlier in the evening. But what happens when a happy hour is for oysters? Yesterday, I joined my friend Lera for the Oyster Happy Hour at Whole Foods. I arrived to two platters holding four dozen oysters, and mistakenly assumed that Lera preordered oysters for the four of us. Wrong! As if I haven’t known this girl for years. The oysters were just for Lera and her boyfriend, Travis. So off I went to order my own two dozen and a glass of wine. I was going to share the oysters with the Artist. However, once I started slurping these delicious morsels, I quickly figured out that the Artist would have to get his own two dozens, I wasn’t going to share. I’m not sure if it was the wine or the oysters, but I was quite “happy”, and possibly tipsy, by the end of the happy hour. Can’t wait till the next one! Oyster Happy Hour from 5pm-7pm! 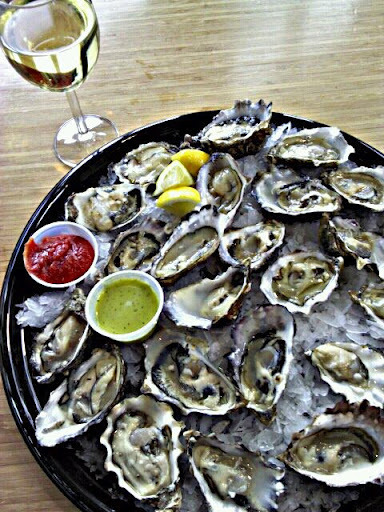 Join us for .69 oysters on the half shell plus wine ($4.99/glass) and beer ($1.99/bottle)! Shuck yeah! This oyster hour rocked my world, glad you decided to come! It rocked my world too! Thanks for letting me come and join you! Thank you! Please stop by any time and let me know if you try any of the recipes. Wow. I don't think I've heard of the Whole Foods doing anything like that here. I'll have to check that out!